← WINE: SA producers feeling the pinch? 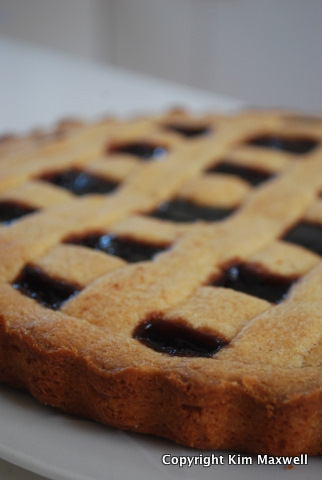 The recipe is a little short on details because Fabio makes it from memory - he doesn’t bother with sifting flour or combining ingredients in a specific order - and the baking time is by feel and the look of the pastry in the oven. But it’s simple, not overly sweet and quick to make. The only fiddly bit is getting the pastry to crisscross neatly. 1. Mix the butter and sugar in a food processor or cake mixer. Add the eggs mixed with a fork. Then gradually add sifted flour, to make a soft dough. 2. Line a 25-cm to 27cm-diameter tart tin with kitchen paper, or use a silicone tart base. 3. 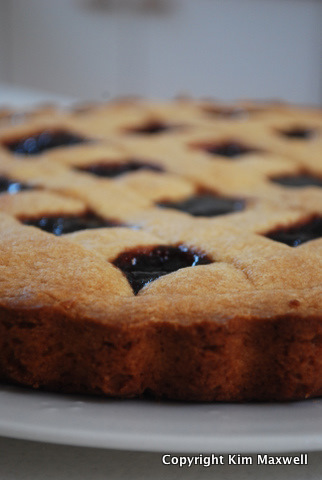 Use about two-thirds of the dough and press gently on to the base of the tart with your fingers so that it’s flat. It should be about 1cm thick. Reserve the rest for the dough strips on top. 5. Take the remaining dough, roll worsies ie lattice strips (Fabio’s South African slang is pretty good) with your fingers. Lay them over the jam filling, flattening them slightly as you lay them and press on to the tart edges (that way the strips won’t stick if they come into contact with the jam). Crisscross with strips running the other way to produce a lattice effect. 6. Bake at 180 degrees celcius for about 45 minutes (up to 60 minutes) or until golden with crisped edges. The time depends on the size of the tin. Serve at room temperature. Blackcurrant or any darker fruit jam works best. Mmmmmm... looks delicious Kim. I love anything with lattice-work! So pretty!! Well all I can take credit for here is the photography, and the eating of the crostata (very important job). I will pass on your message to Fabio.